1. The Book Thief by Markus Zusak - I remember being so surprised when I realized that Death was narrating this novel! There's a lot of things about this book that felt really unique to me, but I definitely think that the way it was written stands out the most. 2. All the Truth That's Left In Me by Julie Berry - This book is written in second person, and I was so skeptical of it before I started. But it totally worked in this story! I loved the way this book was written, and I know the point of view was a huge reason why. 3. Daughter of Smoke and Bone by Laini Taylor - Chimaera, angels, humans... The characters in this book definitely stand out! I love the way Laini Taylor writes - it's so rich and descriptive. But the characters come alive, and I could totally imagine these fantastical creatures in my mind. 4. Harry Potter and the Sorcerer's Stone by J.K. Rowling - Seriously, does anyone write characters quite like J.K. Rowling? There's obviously so much that makes these books unique - the story, the setting, the writing - but it's the characters that stand out most in my mind. They're incredible! 5. The Winner's Curse by Marie Rutkoski - This book has been hyped beyond belief, but I fell for it hook, line and sinker. Seriously, I adore this story! A privileged girl buying a slave boy at an auction? The whole setup felt so fresh - not to mention the fact that I'm always crazy about a slow-burn romance. 6. The Scorpio Races by Maggie Stiefvater - Killer horses coming out of the sea and competing in an annual race? I'm convinced that only an author like Stiefvater could write something this epic and amazing. I adored this story because it felt so different from anything I'd read before! 7. The Sky is Everywhere by Jandy Nelson - I remember checking this book out from the library (don't worry - I ended up buying myself a copy later) and being fascinated by all the "scraps" scattered throughout the book with poems on them. I just loved the whole design of the book - and the story is amazing, too. 8. Amy & Roger's Epic Detour by Morgan Matson - This is another book that I'm SO glad I read as a hard copy instead of on my Kindle. The details and fun surprises throughout the book was half the fun of reading. Receipts, postcards, playlists... there's so much to discover in its pages! 9. For Darkness Shows the Stars by Diana Peterfreund - A Jane Austen retelling in a world where a genetic experiment has left most technology outlawed? I thought it sounded absolutely crazy, and I really wasn't sure it was going to work. By the end of the book, I was in love! The creativity of the setting blew me away. 10. 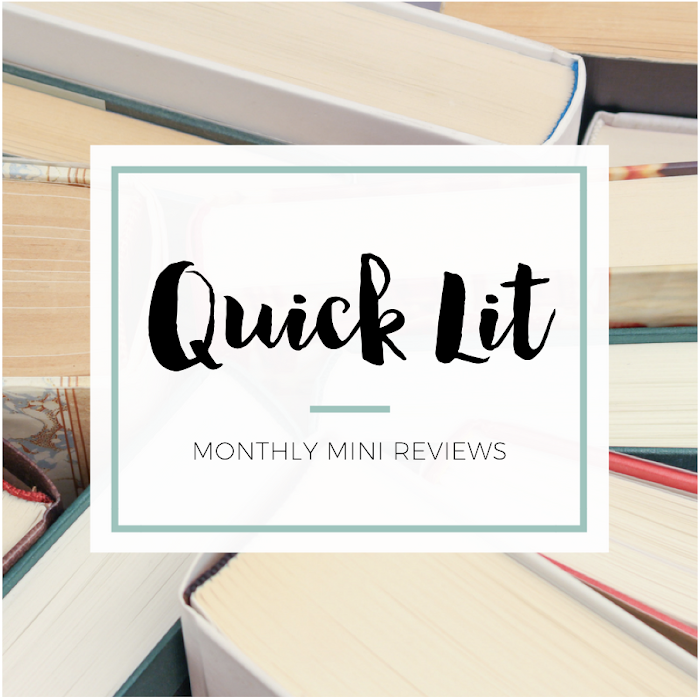 Cinder by Marissa Meyer - I personally liked Scarlet and Cress a lot more than Cinder, but I can't deny that the entire world took me by surprise in this one. It becomes more developed in the later books, but I loved how Meyer retells fairy tales in an incredibly unique setting! I put the Lunar Chronicles on my list too! That series is such a unique retelling. The setting. The plot line. The characters. I love everything about it. And they truly just keep getting better with every book. I completely agree with everything you've said! They're so unique in SO many ways. And they really do just keep getting better! Daughter of Smoke and Bone is my favorite YA series because everything feels so crazy technicolor and new while reading it. I didn't include on my list since I wanted to be a bit more diverse since I share it as much as I can. But, while I enjoyed Cinder, it just felt like since it was a retelling, it wasn't totally "unique" in my eyes. Although it was really different from the original, its just semantics. 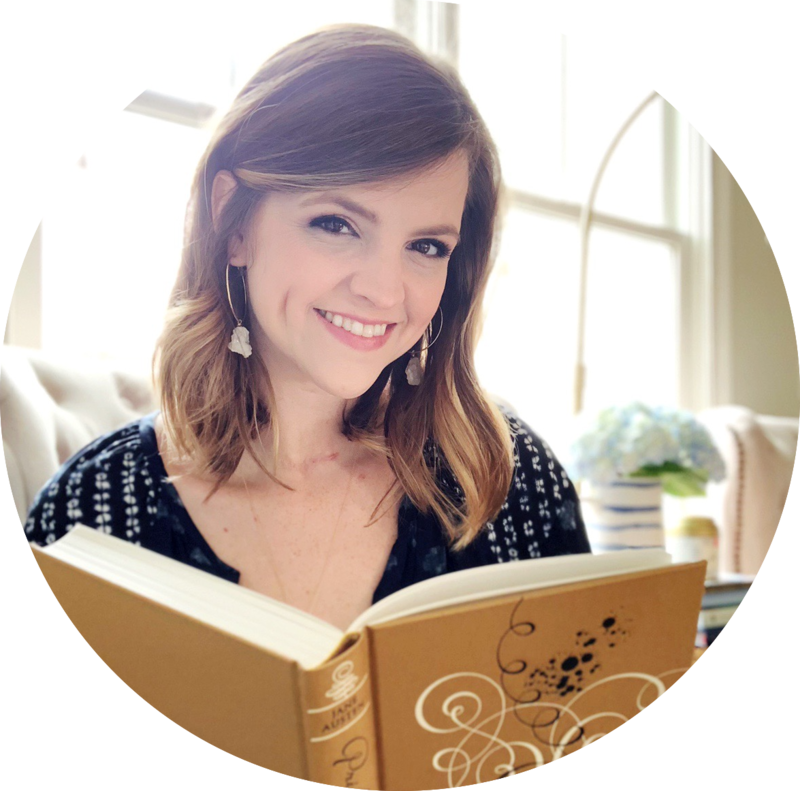 I don't read a lot of retellings, so maybe it stands out in that field! I let a ton of time pass in between reading Smoke & Bone and Blood & Starlight so I re-read book one recently and WOW, I loved it even more the second time around. That series is just so amazing and so fresh! Like you said - everything feels so new. I can see what you mean about Cinder! I actually almost included Scarlet instead so I liked it MUCH better than Cinder (and it's definitely more unique as Meyer ties the characters together) but I just decided to stick to including book one. Haha! Great List! Love a lot of these books! I feel like all the books I read are unique! Especially with Fantasy being my favorite genre! Yay fantasy! It's a genre I've only recently fallen in love with, but I've truly found some great reads in it. Those two books under format sound super interesting :D I don't think I own any unconventional books, the only thing that could be counted as different is perhaps Miss Peregrin's Home for Peculiar Children, but that I got on Kindle. I'm super curious to see exactly what kind of goodies are in between those pages! You'll have to check them out! It's really fun the way they're set up :) They were memorable stories in their own right, but adding the fun goodies too it to another level. THE WINNER'S CURSE! CINDER! DAUGHTER OF SMOKE AND BONE! You've picked some awesome books, Hannah! Glad you second those picks! do you have the UK version of The Sky Is Everywhere? IT IS SO BEAUTIFUL!!!!!!!!!!!!!!! like, I can't even deal. it feels like a real diary and it has blue ink and I'm obsessed with it. it takes the story to the next level. What are you doing to me, E?! 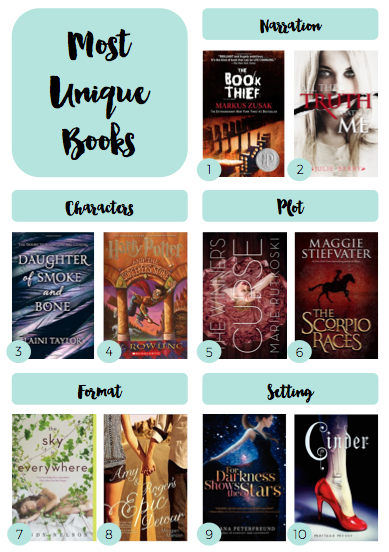 I think it's quite an accomplishment that there are only two books on this list that I haven't read yet (All the Truth That's In Me & Daughter of Smoke and Bone)! All of your other suggestions, and their categories, are definitely spot on. Great list, Hannah! 1. Yay for having read most of these! 2. You MUST read those two! I'm actually really surprised you haven't read Daughter of Smoke and Bone. It seems like such an Alexa book!